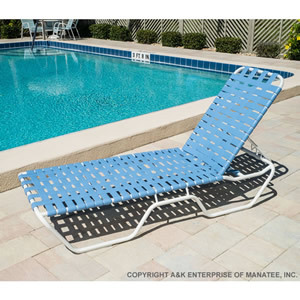 The C120B Cross Strap Pool Chaise Lounge is a commercial chaise with a low, 12 inch seat height and woven, double-wrapped 2 inch vinyl strapping. The aluminum frame is fully welded extruded aluminum tubing that is sandblasted and powder-coated for a superior finish. Made for commercial or residential use, the C120B Cross Strap Pool Chaise Lounge can be customized with a large selection of frame and strap colors. Add another inch to the seat height with the optional nylon super glides.